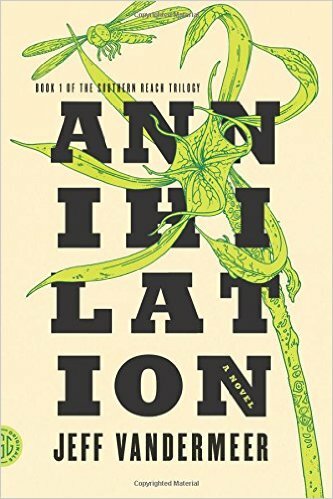 Jeff VanderMeer’s Southern Reach Trilogy (2014) is a welcome change in the trilogy method of speculative fiction story-telling. Although each book builds on the story of the Border and the Southern Reach, the narrative style is very different in each book. Annihilation (Book 1) is told in the first person through the Biologist’s journal and is an expedition/adventure horror story with a non-Euclidean monster lurking around the corner. Acceptance (Book 3) is limited-third narratives of several different characters from the time before Border came down and after. In the first book, all of the characters are women, but we don’t know much about who they are outside of the expedition or what they look like, which is actually really refreshing. In the second, the (new) narrator has more information about the staff of the Southern Reach and the twelfth expedition, so there are more physical descriptions–it turns out the majority of the cast are multiracial POC, at least half are women, and one is queer. In the third book, there are multiple narrators, so some of the cast gets more interiority than the Biologist and Control. The inclusive of the information about the characters’ races and sexualities feels completely natural. Writers, take note: this is how you write diversity into your speculative fiction. I won’t say too much more in the hope of avoiding spoilers, but if you’re a fan of horror-flavored sci fi with incomprehensible plants and an even more incomprehensible government agency, you will love this. Type: adventure/expedition, dystopia (natural and human), spycraft. Content warning: mild body horror, mind control, bureaucratic nightmares, interrogation (no torture), the futility of life/your job, creepy plants, more Lovecraftian mind-bending creatures, foreboding, spycraft, natural disasters, nothing is as it seems, everything is ruined forever. The first book is so good! The second book is even better. In a lot of contemporary male + female dynamics in thrillers (and YA romance), the man is keeping secrets from the woman, which gives him power over her (intentional or otherwise). I really appreciate it that, in Authority, the male protagonist has to struggle with secrets being kept from him by the Biologist, the Assistant Director, the absent Director (and Psychologist from Annihilation), and even his own intelligence officer mother. To me, as someone who reads way too much genre fiction, this shift in gendered narrative roles felt wonderfully refreshing. The relationships between all these broken characters, and the ways in which the bureaucracy of their weird little internal systems was used to stymie the growth of their relationships, were such a pleasure to read. I haven’t gotten to Acceptance yet, but I am a major proselytizer of the first two books and just wanted to jump in and second your recommendation. Posthumanist ecological horror is probably my favorite genre right now, and the Southern Reach trilogy is the best the genre has to offer (next to Margaret Atwood’s MaddAddam trilogy, of course). You won’t be disappointed with Acceptance! It’s like all the best of books 1 and 2 together, plus a backstory about the lighthouse. I also loved the dynamic between Control and Ghost Bird and how it turned gender norms for spec fic on their head. All the characters are so fleshed out and real (or otherworldly), even when you only get a glimpse of them. Thanks for the comment!